Update June 2018: Please note this trip report is from 2014. 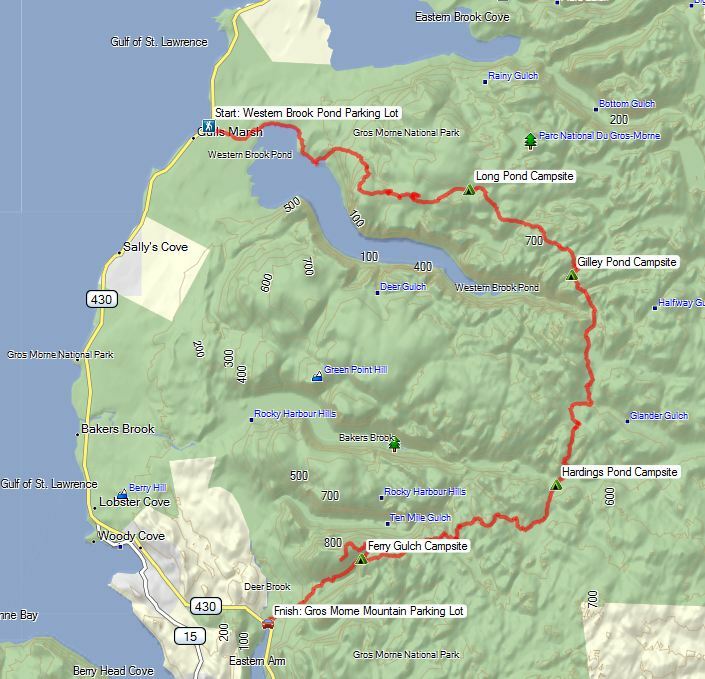 The park now provides much more information including detailed route descriptions, waypoints, and GPX tracks. Check out the park’s Wilderness Hiking section for details. They’ve also compiled the information into a Hiker Preparation Guide. 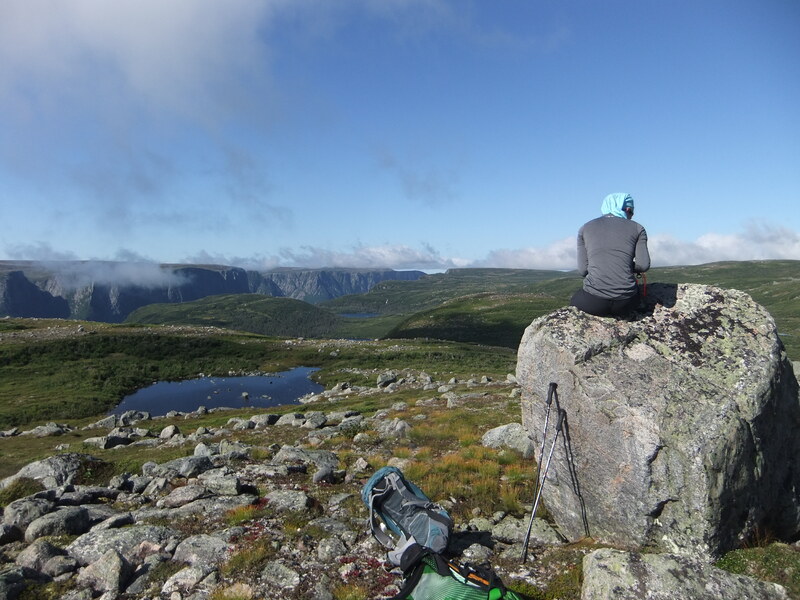 Gros Morne’s Long Range Traverse was always on our list, though never at the top. One reason was that the actual backpacking part would be shorter than the travel time to get there. Once we learned about the North Rim the trip made its way closer to the top. Then last Canada Day while watching the fireworks over Halifax harbour a friend told us he’d heard that the North Rim trail had been closed, and our curiousity was piqued. We called the park and learned that the North Rim had almost been closed for the season due to a hard long winter and very late thaw coupled with heavy rains, but that it was in fact open. Challenge accepted! We took this as a sign that we’d better tackle the North Rim and Long Range Traverse before they were closed due to weather or Parks Canada cutbacks. 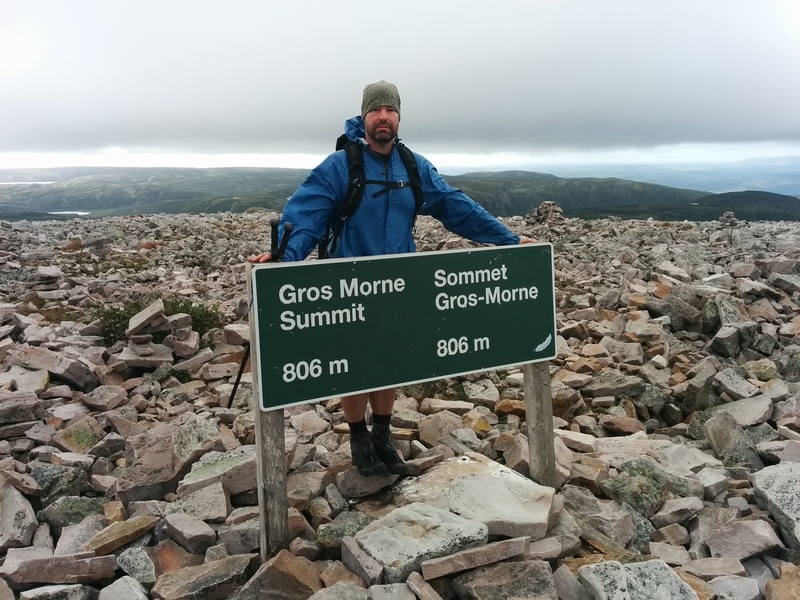 There is limited information about back country travel on the Gros Morne website and it took a few calls to the extremely helpful park employees to establish the basics (most common dates, direction of travel, routes and campsites, etc.). Next we bought maps and began scouring the internet. It became clear pretty quickly that very few people do (or write about) the exact trip that we had in mind. This would be our longest off-trail trip to date, and we wanted to be well prepared. Planning this trip was going to be far more complex than our average backpack. It was hard to find the information we were looking for and just winging it wasn’t going to work, so it took some digging around. We’ll post a separate blog about the planning stage sometime during the cold winter months. Our plans gradually fell into place and we set out early in the morning of Thursday, September 4th. As always, we were travelling fairly lightweight. Our packs were 36L/38L, and 24 pounds each to start including consumables (we didn’t pick up water until we were preparing for the climb up out of Snug Harbour). We were planning to spend 2 nights on the North Rim (Long Pond and Gilley Pond) and 2 nights on the Long Range Traverse (Hardings Pond and Ferry Gulch) and to be back at the car Monday afternoon, though we got a permit for one extra night to have some flexibility in case we (or the weather) decided to lengthen the trip. 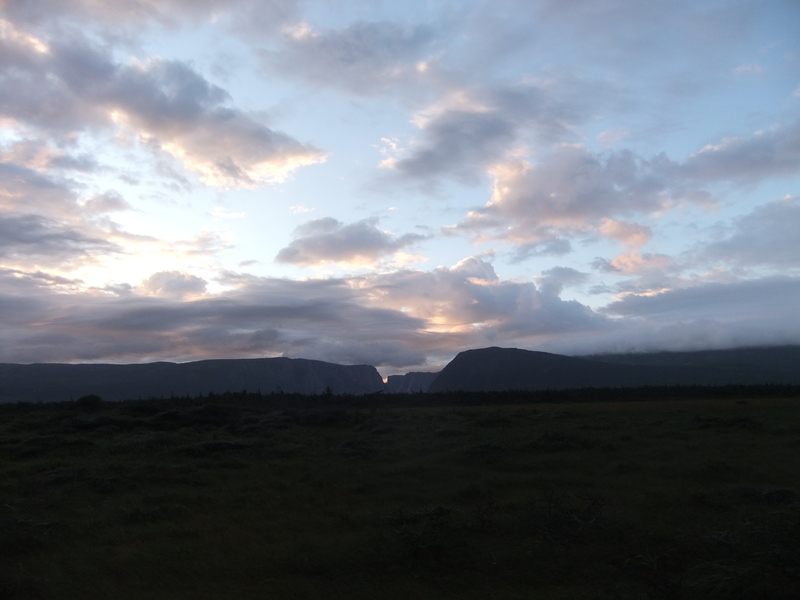 Our taxi was waiting as we pulled into the Gros Morne Mountain parking lot at 6am to drop off our car. It was a quiet 30-minute drive in the dark to the Western Brook Pond trailhead and we were the only people in the parking lot when the taxi drove away. After taking a few minutes to finish the last of our breakfast and take care of the last-minute adjustments, we set out on the boardwalk about 25 minutes behind schedule. The early morning sky was beautiful. In a possible foreshadowing of what was to lie ahead, water flooded the path in a few places. We reached Western Brook easily and took a moment to read the sign which told us, “Do not attempt to cross when currents are strong”. It did not give any indication about how to make such a judgement, however, and given that our only other option was to go home… we loosened our packs and jumped in. The cable made it easy enough, though at belly-button depth it was a wetter than expected start to the day (for us and our camera, unfortunately). The trail to Snug Harbour was wet as expected. 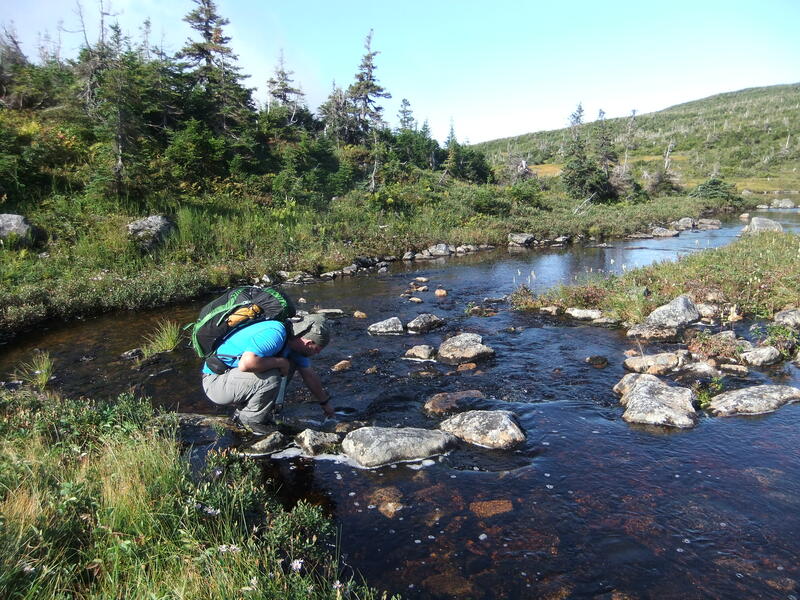 What was unexpected were the two other smaller river crossings, both almost knee-deep. 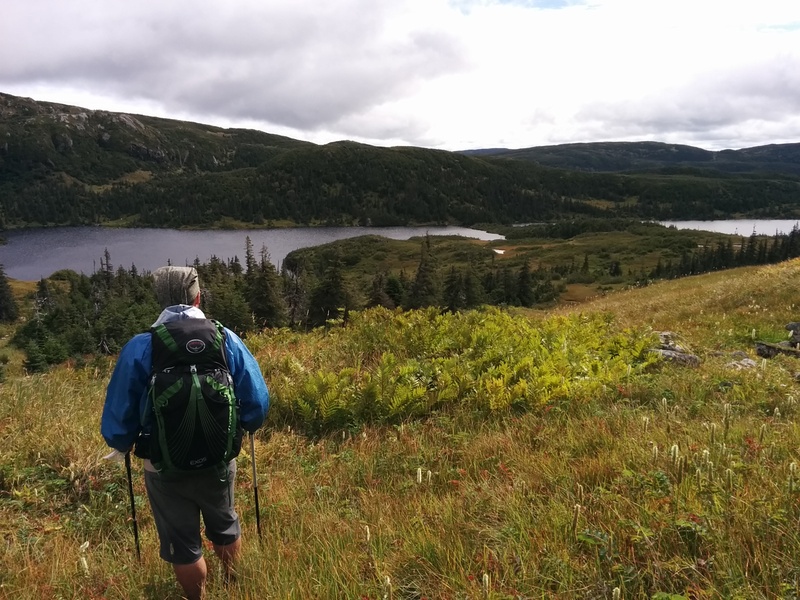 The trail was easy to follow until the last few hundred meters when we were first introduced to Gros Morne’s maze of animal trails. One small detour and we were ready to pay closer attention to the map and compass, especially since Snug Harbour marked the end of the established trails (or so we thought). After a quick bathroom and snack break we headed along the beach towards an old signpost. The signpost unexpectedly marked the beginning of an old trail that appeared to be going in the right direction… up. Most of the time we felt confident that we were making forward progress, the rest of the time we spent looking at the map to convince ourselves we could follow the trail “just a little further” before having to step off into the forest. It eventually brought us up the 700m in elevation far easier than we could have imagined while standing on the beach, looking up, and contemplating where to even head into the forest for the uphill battle. The climb was a relatively gentle 3km sweep that spit us out above the treeline, right on target. Considering that we had imagined a dense forested mountainous bushwhack, this was a huge morale booster. We had made it to the top of the gorge ahead of schedule and feeling pretty good. Now that we were in the great wide open it was time to have lunch and enjoy our first glimpse of the breathtaking views to come. Relaxing in the sunshine for a few more minutes, we reviewed the map again, looked around at the terrain, and scoped out our route to Long Pond. We would travel from high point to high point in the general direction of our proposed route. Spotting our route from the high perches proved to be a very efficient way to navigate, and the extra bit of up and down was well worth it. This section would also include our first encounter with the North Rim’s infamous tuckamore. We had asked the park staff how tall the tuckamore was generally, “Knee, waist, or neck deep?” The response was knee deep…. they fibbed. It certainly didn’t look more than knee deep from a distance until you waded in… and the sky disappeared. After intentionally heading off through a patch that “doesn’t look so bad” we pretty quickly became adept at plotting routes around tuckamore and again appreciated having small light packs. 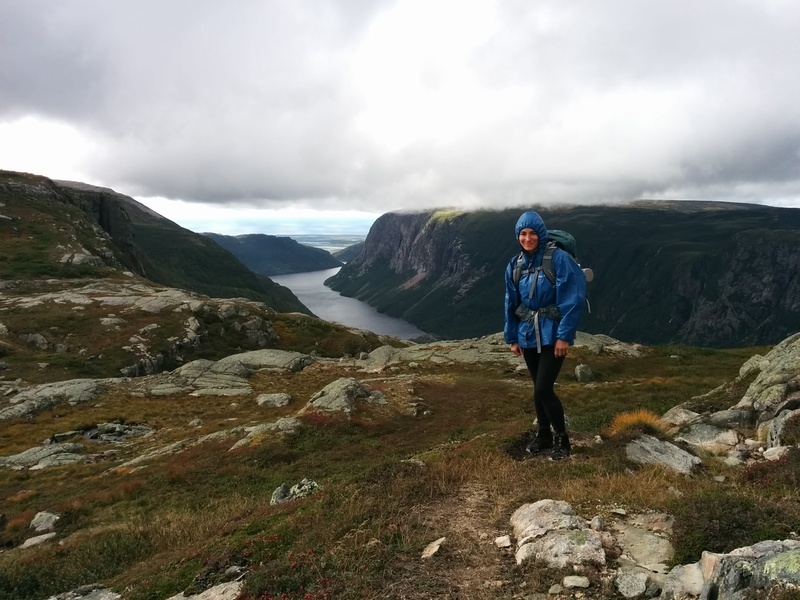 It would be a very different trip carrying the packs we saw in most Gros Morne pictures. 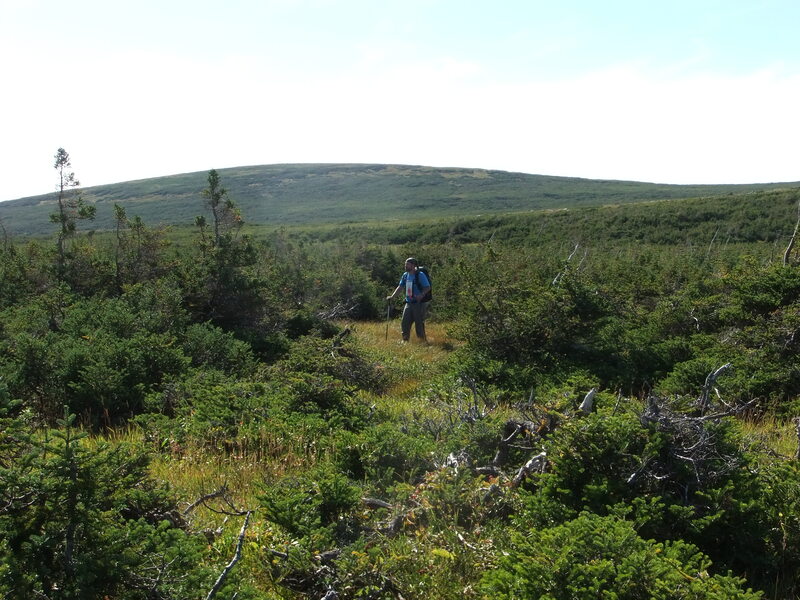 As we were making our way east toward Long Pond we noted what looked like a few moose or caribou on the next high point. We kept hoping they would move off but they persisted as we drew closer… until one waved and we realized it was in fact just a group of hikers headed in our direction. Apparently they’d been moving back and forth trying to choose their path down from the ridge. 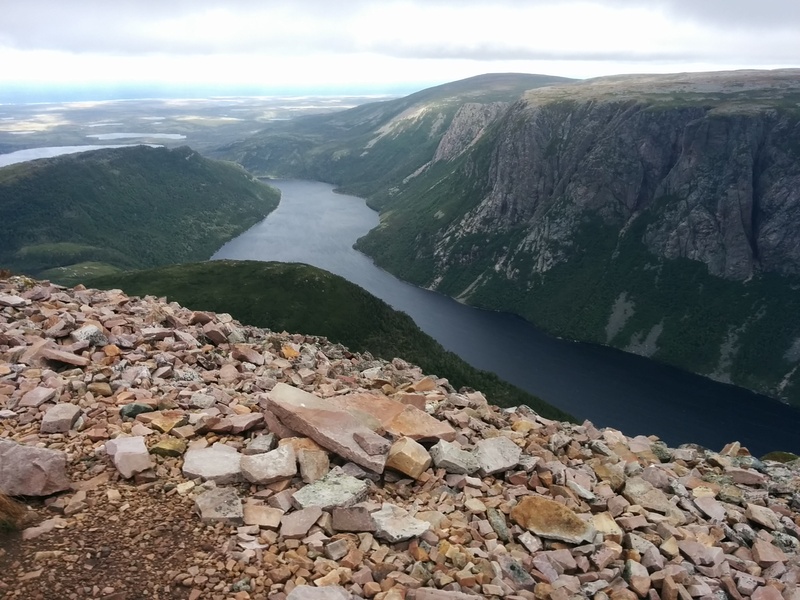 We learned that they were doing the North Rim in the opposite direction, having been dropped off from the Western Brook Pond boat tour at the bottom of the gorge four days ago. They were already one day behind schedule and were determined to make it out that day, after having spent what sounded like an absolutely miserable night half camped out in the tuckamore in a puddle in the middle of 30mm of torrential rain. I think they were demoralized to hear we’d been on the move for about 7 hours at that point, though we did tell them that as long as they were able to reach the peninsula beyond Snug Harbour before dark, they would be able to walk out carefully with headlamps (we later learned they made it to Snug Harbour that evening and decided to stay on more night on the trail). 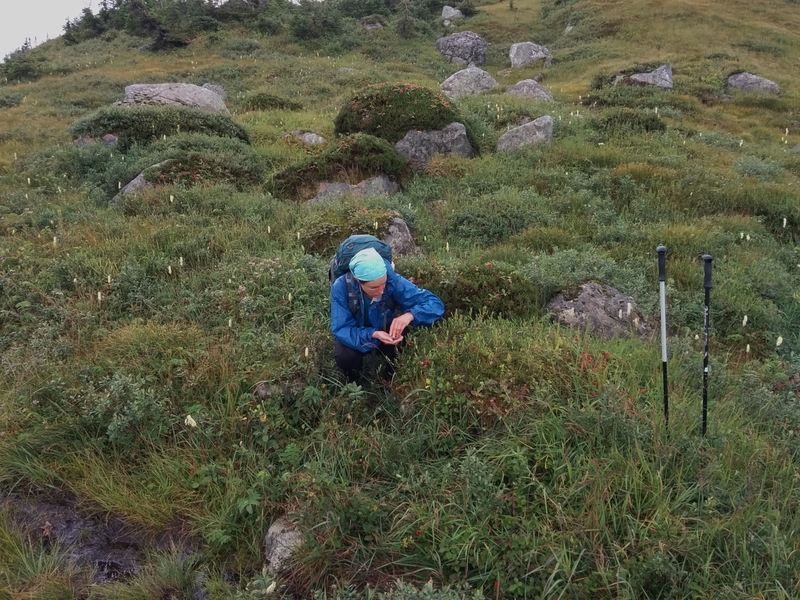 At this point the navigation became easier with smaller patches of tuckamore, more open ridges and easily identifiable ponds. There were lots of animal trails, but most often they were heading toward water perpendicular to our route. After an hour or so we climbed the last ridge separating us from Long Pond. Finding the campsite was easy, but we were definitely exhausted for the last hour or so following animal tracks meandering though bogs and scattered tuckamore along the lake’s north shore. 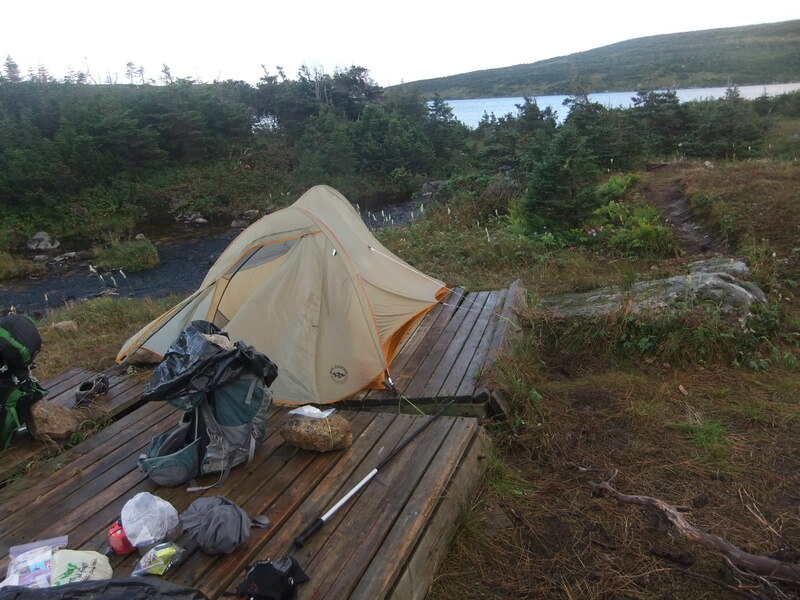 We were thrilled to reach the campsite, but surprised to see only 2 tiny broken tent pads, narrowly positioned on a wet stretch of land between two branches of a stream running down to Long Pond. We were also perplexed by the presence of old metal fire rings (we understood no fires were allowed in the backcountry). This campsite was a huge let down and we were a little concerned at what we’d see at the next one. The evening was wet and cold and getting dark fast so we set up camp quickly and fell into the tent as soon as we’d eaten. It was a cold misty morning. We packed up and discovered the “outhouse” just across the river in a clearing the woods. The sign was not visible from the tent pads. The outhouses are ingenious one-piece moulded plastic seats with a shoulder-blade level privacy shield most of the way around. Because they are open there is very little smell. We read that they are pumped out each year by helicopter. If you don’t mind the exposure, they are actually quite lovely and some have absolutely unparalleled views. 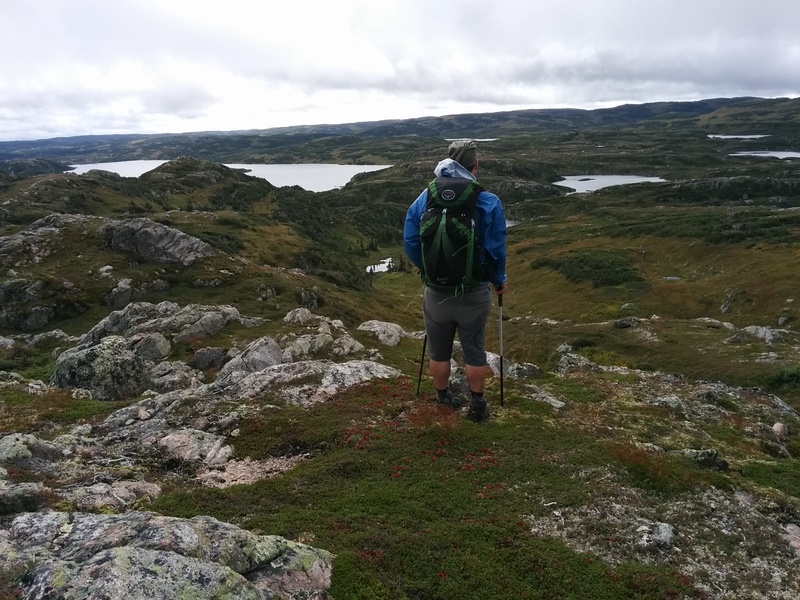 This was the day that we began to appreciate the navigation challenges that glacial-swept terrain presents with rolling hills and countless tiny bodies of water too small to be useful for navigation. It was breathtakingly beautiful in places as we hiked through peaks and valleys with easily avoidable tuckamore for most of the day. We also had our first real wildlife interaction this day. 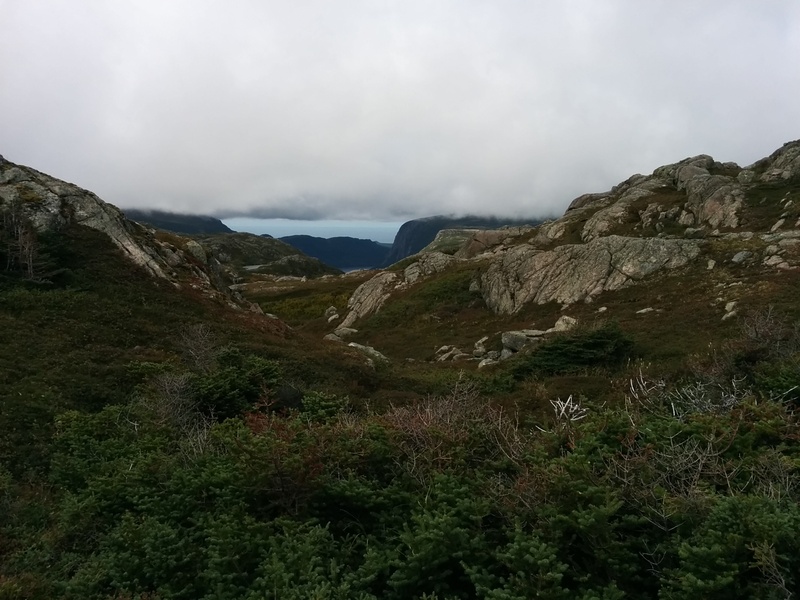 We crested a ridge and saw a caribou ambling straight toward us. He seemed quite interested in coming over to say hello and it was only after we made a huge circle off to one side that he eventually continued off in his original direction. Surprisingly, that was the only caribou that we saw on this trip. Actually arriving at the Gilley Pond campsite was the big challenge of the day. We could see exactly where the campsite should be from quite a distance, though we were never quite positive because we couldn’t see tent pads (turns out there aren’t any!). Eventually we saw the bear box but still kept ending up on ridges with impassible cliffs just above the lake. On our fourth approach we made it down. The site was saturated but the sun was shining, it was early in the afternoon, and there was a tiny spot just big enough for the tent that wasn’t soggy underfoot. We had a fantastic supper of pasta and pesto and even managed to dry out few things. It was a lovely evening! The views from Gilley Pond are spectacular. So are the views from the Gilley Pond outhouse, though it was hard to find… again. It’s actually located in the opposite direction from the bear box, and faces the pond. This means it also faces the trail which runs between the outhouse and the pond, but if you aren’t worried about privacy it definitely has the best outhouse views in the park! We both agreed that the area around Gilley Pond was the most spectacular of the entire trip. If you have extra time, spend it here. Absolutely. We packed up a dry tent and headed up over the first ridge. No tuckamore here and the views were expansive! Beautiful glacial-swept rolling hills, numerous waterfalls and clear ponds. The first pond we came across even had a sandy beach! We can’t say enough about this part of the hike. We don’t have a single photo that captures the magic of this place, but it was an absolutely wonderful few hours. 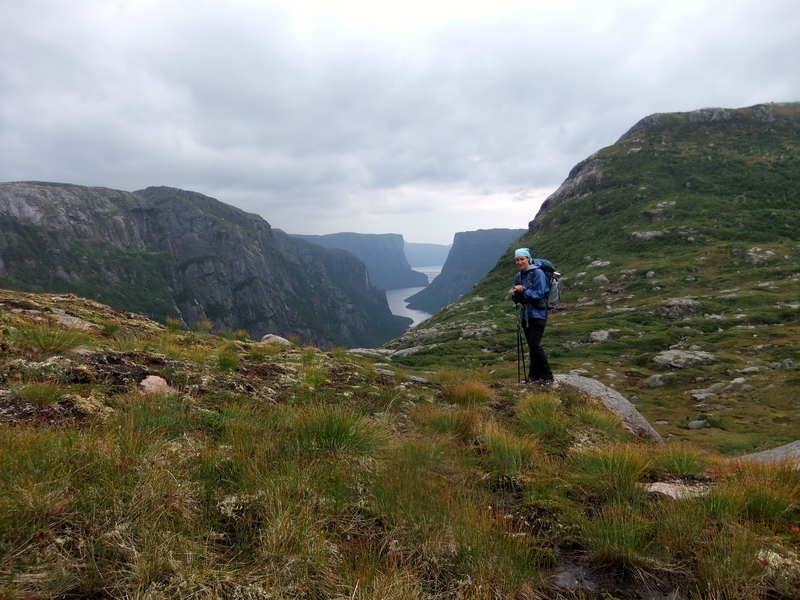 Although we could have stayed and explored for days, we decided to stick to our plan and it was less than two hours to the top of the Western Brook Pond Gorge. 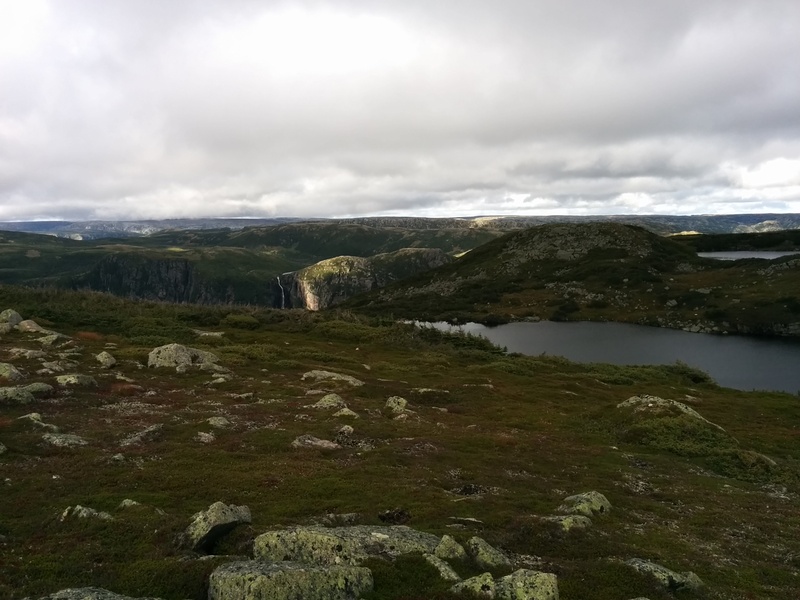 Our route would take us a few hundred meters above the “million dollar view” and we had half-heartedly debated whether we’d hike down, but it was starting to rain and we knew this wasn’t the day for photography. We grabbed a few quick shots from the trail and kept going. From here on we knew the route was well traveled and the worst of the tuckamore was behind us on the North Rim. The rain and wind and fog came in stages, but this was definitely one of those days that the park recommends you stay dry and wait it out. 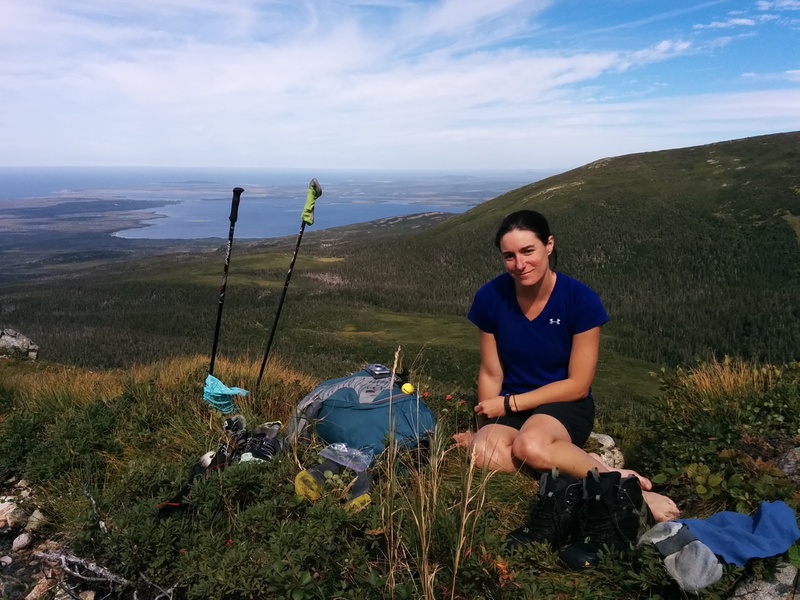 It was warm though, and so we decided to push on, though I wasn’t sure how happy I was going to be walking out of two perfectly good campgrounds on our way to Hardings Pond. At least the navigating was easy for this part, and we made good time. We stopped for a quick bathroom break at Little Island campsite and kept going. We noted that one of the newer tent pads was located literally at the water’s edge (you would need to be careful here after dark!) and had a fallen tree hanging over top of it. In our only real navigation blunder we got a little turned around approaching Mark’s Pond. Instead of taking the shorter route along the east side of the pond toward Hardings we made the day a little longer by heading back around the lake on the campsite side. We never actually saw the campsite, though I’m sure we were within a few dozen meters of it. 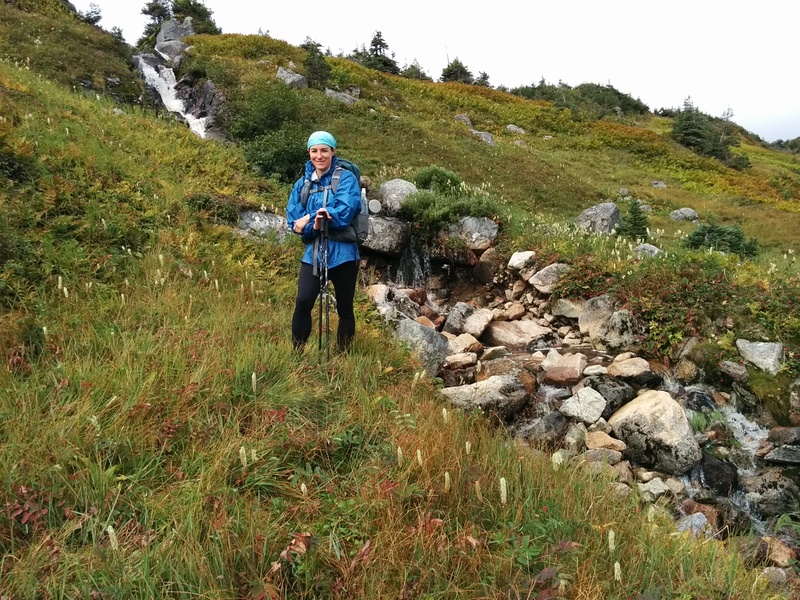 At this point we were both soaked but comfortable and focussed on getting to Hardings Pond so it hardly mattered. At the far end of Mark’s Pond we went about a hundred meters out of our way on a very well traveled animal/human trail before realizing our error and stopping to regroup. I made quick chicken and cheese wraps in the rain while Wade studied the maps. So glad we were extra careful to pack quick and easy meals suitable for adverse conditions on this trip! We decided to head for the “notch”. This “notch,” along with the “boulder” (coming up tomorrow) and the “approach to Ferry Gulch” are really the only waypoints provided by the park other than campsite locations. Very thick fog had set in and we decided to use a combination of map, compass, and GPS to pass over the notch toward Hardings Pond. With frequent location checks we made our way over without any difficulty and were on the home stretch. On the other side of the notch a ranger’s cabin came into view, complete with a dock and a few small boats. We joked about walking over to see if the doors were open, and a few hours later found ourselves wondering if we would have been happier stopping there. But we had a trip plan, so we pushed on. By this time we were starting to cool off and it was very slow going with deep mud and patches of tuckamore. We arrived at Hardings Pond around 3pm and were met with torrential bursts of rain. The wind had picked up to near storm force gusts. We hadn’t seen another person all day and were somewhat surprised to see a tent set up on a tent pad nestled into the steep bank. The other pad next to it was fully exposed, crumbling, and leaning off to one side. We stopped to briefly say hello to our candy-bearing fellow hiker, and headed off in search of three new tent pads that we had been told were located “just above” the old ones. We were astonished to find each of the tent pads located higher and more exposed than the one before. Wade ran back down to re-evaluate the crumbling pad while I stayed at what seemed like the best choice to make a pot of tea; we were both getting chilled at this point. We decided to try this location which was stunningly beautiful for a picnic on a calm day, but nowhere that you would ever want a tent in a storm. After two separate gusts completely flattened the tent, poles and all, we knew it was the crumbling pad or nothing. We headed back down as the skies opened up. Wade propped up the tent pad best as possible and we somehow got our tent pitched between the huge gusts. Wade jumped inside with a pack towel to mop out the 1.5″ of water inside while I repacked our bags, grabbed some instant supper, and placed everything else in the bear box. Thanks to pack towels, emergency blankets, and a supper of Clif bars, cheese, dried fruit and brownies, we gradually warmed up. 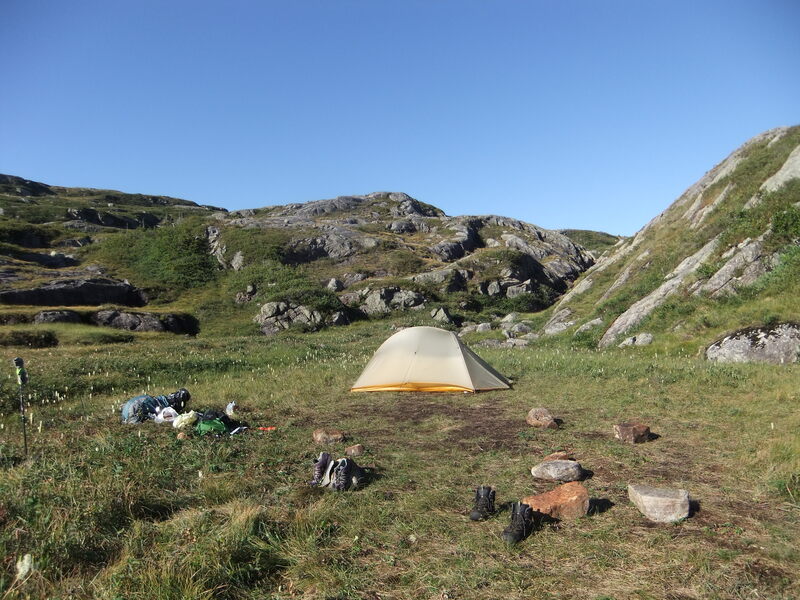 We chatted a bit with our neighbour (the tents were close enough to talk between wind gusts) and after a few hours it was dry enough that we dared to pull out one down sleeping bag to share. Knowing that we had at least one more night we decided to leave the other securely inside its dry bag. That was quite the day. The rain had passed by morning. Still, it seems we didn’t stop for photos. We packed up before our neighbour (he had a shorter day planned just to Green Island Pond) and quickly had a decision to make. 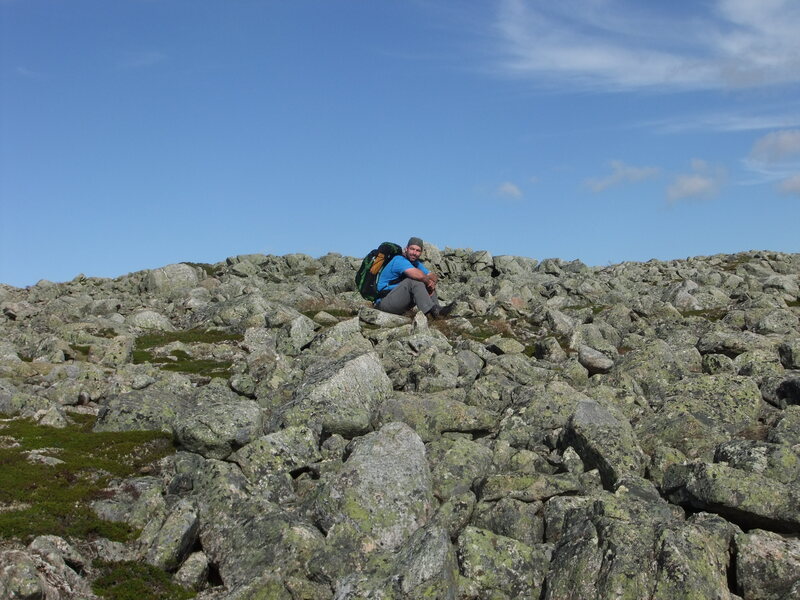 We had been told it was difficult to get out of Hardings Pond because of circular animal trails and the easiest was to take a bearing to “the boulder” on a high point off to the southwest. We could see the boulder, but decided to follow tracks in a more southerly direction. It ended up being longer but incredibly scenic and we would highly recommend the route. We passed along the shores of Big Stag Pond and were planning to head around the next pond as well to rejoin the route we would have taken had we passed the boulder, when we saw a huge moose on the other side. He was standing still, and we decided that we wouldn’t head in his direction. There was a small waterfall between the two lakes where we were able to cross over, then continue on to the Green Pond campsite. The navigating was definitely getting more challenging as the features became less distinct. We had a quick lunch at Green Pond on lovely tent pads, but with horrible flies (the only flies of the trip!) and set out to figure how to cross the river. We walked upstream and downstream before eventually picking a spot just below the tent pads. The river was wide and the water was high and fast and we initially felt like there must have been some other easier route that we coudn’t see. Loose packs, trekking poles and slow careful steps got us across. On the other side we could tell that we were in the right place as a well worn trail headed up and away from the water. Heading toward Ferry Gulch was a bit of a mental game. The navigating was challenging. Was this the pass between the two lakes that we saw on the map? Or this? Or this? Too many bodies of water to even begin to count that resembled the ones on the map less and less. Over one crest we popped up in front of a moose, but luckily he kept eating as we climbed up a steep hill and over into the next valley. 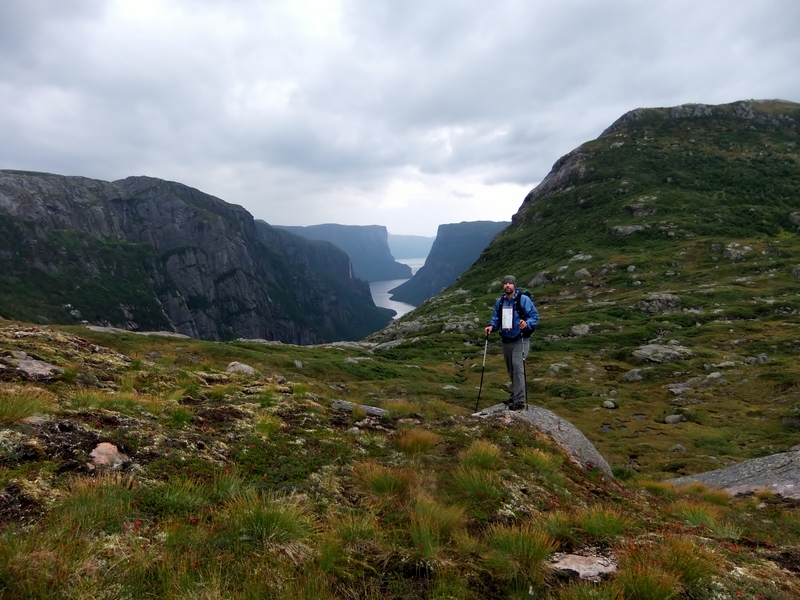 We hadn’t slept well the night before and were debating walking straight to the car and returning to hike Gros Morne mountain at a later date instead of our planned last night at Ferry Gulch, and we went back and forth as we kept making slow progress. On the top of one peak Wade stepped onto a totally innocent looking patch of ground and fell almost waist-deep into a completely hidden frigid bog. It was cold, windy and exposed and we kept pushing on. Gros Morne mountain eventually came back into view (we had seen it briefly earlier) and we headed for the waypoint that marked the top of the descent into Ferry Gulch. We had read a bit about this area, but were not expecting the almost vertical pitch and big boulders on the way down. Again, time to be thankful for small packs. Luckily there were lots of tree roots to hold on to, and we made it into camp in daylight. The off-trail portion of the trip was complete. Once again, we decided to stick to our original plan and spend the night in Ferry Gulch. Wade’s feet were definitely happy for the break! He was unfortunately stuck with “waterproof” footwear for this trip and unlike my mesh sneakers, his held the water. 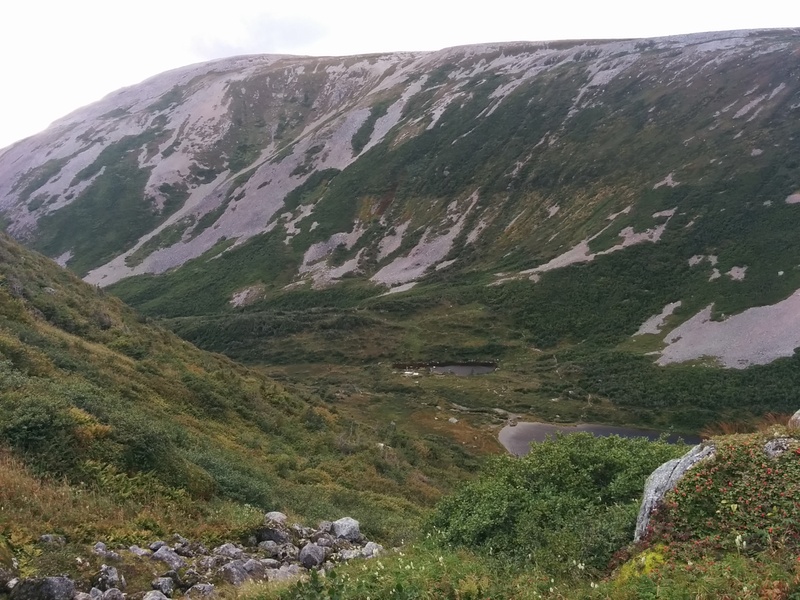 Gros Morne mountain getting closer and Ferry Gulch campground by the pond below. Ferry Gulch is another beautiful campsite, but its downside is that it is very much “frontcountry” camping. Unlike the previous campsites there were makeshift firepits and litter everywhere, and the bear box had a whole bag of garbage that someone was too lazy to carry out. We tidied up a bit, but it would have taken some big garbage bags to do it properly. Here again the new big tent pads were completely exposed, so we chose a small older pad, made a huge supper of ground beef, mashed potatoes, corn and gravy, and were quickly asleep. We awoke early and just as Wade was about to get up to use the bathroom we heard something large rustling close by. We laid still for a few minutes to listen and could tell it was definitely very close. Wade slowly unzipped the fly enough to peek out and watched a large moose munching just a few feet away. We decided to wait him out. After a while it grew quiet and just as we were about to get up we heard him again, much closer, huffing, puffing and sounding agitated. Before we could decide what to do next something spooked him and he charged right past the tent. The closest footprint was clearly visible about 3 feet from where we were lying. Close enough! 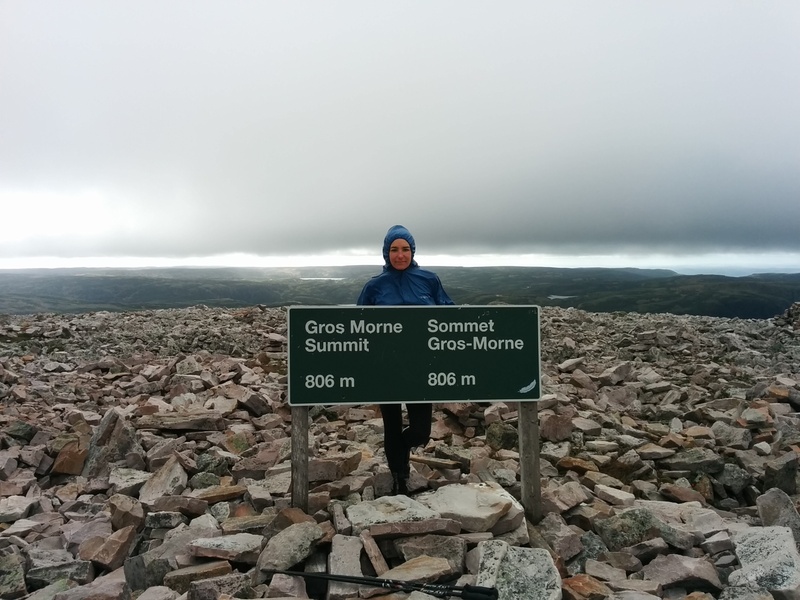 We left the tent standing to dry and headed up the back way to the top of Gros Morne Mountain. This was a fairly easy walk with long segments of boardwalk and steps. The wind grew colder and stronger as we climbed, and it was almost enough to knock you off your feet at the top. The views were spectacular, but we didn’t linger long and quickly headed back down to grab the tent and hike back out to the car. Cold windy summit, take 2. We were back at the car shortly after noon, and headed straight for one of those incredible post-backpack gas station coffees. The trip was a definite success! We called to book a cabin in Shallow Bay for the night and arrived just in time to see the sun break though the clouds onto a patch of green grass outside the cabin. We decided we had just enough energy to dry our gear and get the laundry done before a nap and huge rib dinner at the restaurant across the street! The high was undoubtedly the North Rim views. They were unexpectedly spectacular along its entire length, topped off by the area around Gilley Pond. The lows were the placement of the tent pads, particularly the new ones. While obviously situated for spectacular views, they placed you above any possibility of shelter, making them dysfunctional in the conditions that we experienced. It was an incredible few days for sure! Feel free to send us an email at misadventuresinthewild@gmail.com. Thanks for making it available to us. ← It Was Cold… For Here.